Who knows hair better than Richfeel!!!! Hair is an essential part of the body. Beauty is associated with crown of healthy and beautiful hair. Be it on the head, on the eyebrows and on the lashes. But on the Body.. I Don't Like. Particularly the facial hair, I just hate them. I always do threading, waxing, hair removal creams ect. All these are so painful and risky. Skin gets damaged due to all these hair removal options. Skin burns, irrigates, boils, red patches and is very very painful. These options remove the hair but the hair come back. I have heard about lots of permanent hair removal treatment. But I was not satisfied and was afraid. Then I attended this meet at #Richfeel and studies about the RF IceCube Laser Hair Reduction. Reduction is the perfect treatment and not the hair removal. After understanding the entire process I gave a try to the treatment. My laser treatment was scheduled for 16th December, 2017 at the Chembur center. First part of the treatment is the doctors consultation. Where the doc questions to know some information about ourselves. 1. Any medical issues like thyroid, diabetes ect. Doc checks the growth of the hair and gives the information of the RF ICE CUBE Hair Reduction laser Technology. Explains the 80/20% ratio of hair growth and reduction. Sessions depend upon the ratio of the hair growth. Lastly the hair reduction treatment is done by the special consultant. First the hair is shaved from the area of treatment. Then gel application with the laser. Lastly moisture application. Infact I just felt like a normal facial and was done in just 15 minutes. So happy no more threading to be done for facial hair and most importantly upper lips. 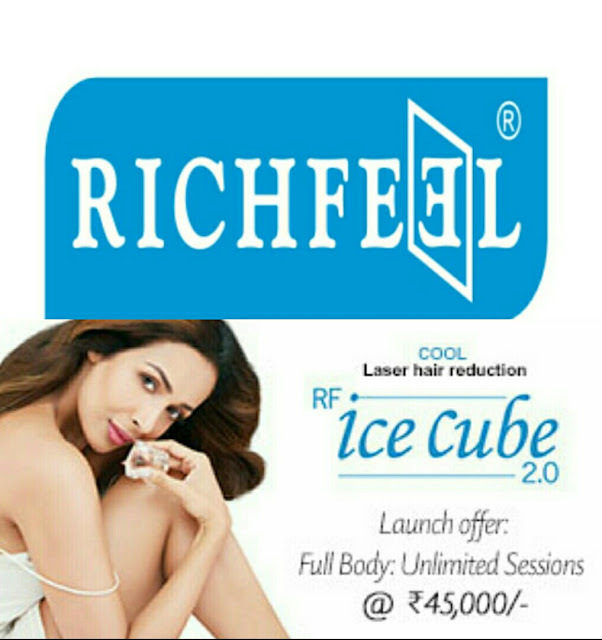 RF ICE CUBE 2.0 Cool Brush Hair Reduction Technology is a hair reduction system that is painless, latest cooling, permanent hair reduction method. This technology has been imported from Europe and is the most effective, quick and painless hair removal with maximum comfort and no recovery time. Facial Hair Reduction package is for 17000/- after discount. This is best option for hair reduction.